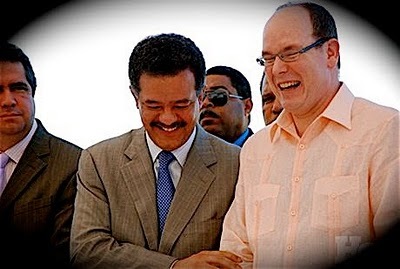 Prince Albert II of Monaco has yet to explain why he traveled to the Dominican Republic to actively promote and appear publicly for the Punta Perla development (aside from escaping Monaco). Investors in the Punta Perla fraud were swindled out of $60 million. Punta Perla was a private real estate project that sought to entice middle-class Europeans to deposit hard-earned savings for as-yet-to-be-built Caribbean vacation homes. Albert is a head-of-state. One can understand Monaco’s Sovereign promoting private interests if it involves trade, commerce or tourism for Monaco, such as helping promote a new resort by SBM or Monaco QD. But a head-of-state allowing himself to be used as a celebrity endorser to help line the pockets of non-Monegasque con-men in a far away land? What’s next, Albert doing TV ads for Viagra? What did Albert stand to gain from his involvement in the fleecing of $60 million from hundreds of small investors? The Punta Perla development was relatively small for the billionaire prince, especially when he has the government of Qatar writing blank checks to spend on much larger projects through his Monaco QD entity. So what (or who) induced Albert to get involved with Punta Perla’s main organizer, scam artist Ricard Miranda MIRET, whose previous property projects were failures? It is clear that something corrupt transpired to get the Prince to the Dominican Republic. Why did Albert get involved in Punta Perla? How much money was Albert and/or members of his entourage paid? Will Albert give up his fee to help pay restitution to the victimized investors? What does Albert know about the whereabouts of money stolen from investors? What does Albert know about Ricard Miranda MIRET and his current whereabouts? Does MIRET have a bank account in Monaco? We wish success to the victims of Punta Perla and their skilled attorneys at Law Bird as they seek justice, and we hope that Ricard Miranda MIRET and Prince Albert are held to account for their misdeeds. MUST SEE!!!! Watch this broadcast where spymaster Robert Eringer calls Ricardo Miranda a con man for defrauding investors for USD 60 million – CLICK HERE!!! This entry was posted in Uncategorized and tagged dominican republic, leonel fernandez, monaco, news, newsletter, prince albert, problems, punta perla, real estate, ricardo miranda, scam by admin. Bookmark the permalink.